We offer Rear View Back up Camera System, Reversing Camera System, TFT LCD Monitor, Auto Shutter Camera and CCTV Camera for Car, Heavy Truck, Trailer, SUV, Farm Tractor, Forklift, Compactor Vehicle, Street Sweeper, Mobile Home, Passenger Bus and Mining Vehicle. We've been in this field since 1997 producing cctv cameras and car rear view camera systems. In 1999 we were the First factory producing infrared waterproof camera in China. Since then we served thousands of customers perfectly. We absolutely know we do not have the lowest price on the internet. All of the products are designed by ourselves, we choose the best materials from USA and Japan, we do not use any electrical components made in our China, because we need high quality material to ensure the stability of our products. We have professional engineers who have ten years' experience in this field. So we can help our clients to solve any fault in use. We are top quality, we passed following tests. Load dump means the disconnection of a powered load. It can cause 2 problems. Failure of supply to equipment or customers II. Large voltage spikes from the inductive generator(s) In automotive electronics, it refers to the disconnection of the vehicle battery from the alternator while the battery is being charged. Due to such a disconnection of the battery, other loads connected to the alternator see a surge in power line. The peak voltage of this surge may be as high as 120 V and the surge may take up to 400 ms to decay. The transient high voltage which ususally occurs in automotive will damage the rear view camera system, if the system has no protection circuit. Our monitor uses a special component inside to avoid the damage. The transient high voltage will never damage our monitor. Following shows the test procedure. Connect power supply to DC input of load dump generator. Connect output of the load dump generator to component power supply lines. Set DC supply so that DC voltage to the component is 13.8VDC measured at the component. Chassis of DUT shall be physically isolated from the ground plane, and the DC supply should be electrically grounded to the ground plane. After test our monitor has no damage at all. Electrostatic discharge (ESD) is the sudden flow of electricity between two objects caused by contact, an electrical short, or dielectric breakdown. ESD can be caused by a buildup of static electricity by tribocharging, or by electrostatic induction. ESD includes spectacular electric sparks, but also less dramatic forms which may be neither seen nor heard, yet still be large enough to cause damage to sensitive electronic devices. Electric sparks require a field strength above about 4 KV/cm in air, as notably occurs in lightning strikes. Other forms of ESD include corona discharge from sharp electrodes and brush discharge from blunt electrodes. The ESD will do harm to rear view camera system if there is no ESD protection circuit. When user operate and touch the monitor, the high electrostatic voltage of 2kv/4kv/5kv/6kv/8kv will discharge between the user and monitor, and the high voltage will damage the monitor. The high electrostatic voltage will never damage our monitor. Test methods: contact or air discharge are both acceptable. Isolate the DUT from ground-plate. We apply the discharge of 2kv/4kv/5kv/6kv/8kv to every point that the user may touch when operating our monitor. After test, our monitor still work well, no damage at all. IP69K Waterproof and Dust-proof Test. 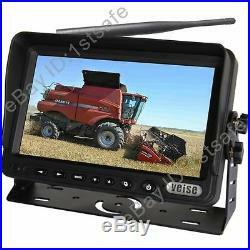 7 DIGITAL Wireless TFT LCD Monitor X1. DIGITAL Wireless IR Camera X1. This is a digital wireless camera system. It means only the signal is wireless. The monitor and the camera do not have built-in batteries. They should be connected to power to work. What is the difference between analog wireless camera system and the above digital wireless camera system? Both of them use the same 2.4GHz frequency technology. The 2.4GHz frequency is very common , many of our wireless device use this frequency, such as wireless router, bluetooth, etc. So the analog wireless camera system sometimes receives signal wireless routers, bluetooth and cellphone, and interferenced caused. There is no other device can transmits the same digital signal as the camera. Digital Wireless Split/Non-split Monitor Camera system. No Need to Run Cables Through Farm TractorHorse Trailer, Allow You to View Your Horses and Back View. 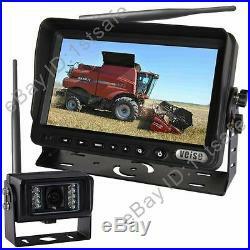 7 Digital Split Screen TFT LCD Monitor Built-in 2.4GHz Digital Wireless Receiver, NO INTERFERENCE AT ALL. Monitor Using Techwell(made in USA) main chipset, industrial grade chipset, specially for auto electronics, more stable. CAM1 with rear view distance scale. CAM1 an CAM2 with mirror image. Image Modes: single view or split view. When monitor displays in split view mode, the rear view distance scale will not be displayed on screen. DC14+87V(Td400mS) 5pulses Load Dump Test Passed450cd/m2 Brightnes. 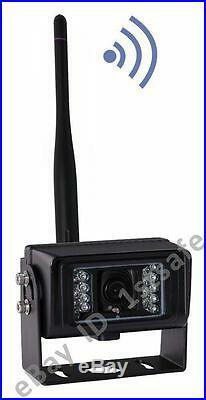 2.4GHz Digital Wireless Camera Aluminum Camera IP69K Waterproof and 10G Vibration, IR LEDs for Night Vision. 7 Digital Wireless TFT LCD Monitor. Digital Screen displays more clear than analog screen monitor. NO INTERFERENCE, NO WORRY ABOUT RECEPTION. In the above picture the red wire is for DC10-32V positive polarity. The black one for negative polarity. The brown one is the trigger wire for camera1. It can be connected to reverse lamp power or kept blank. The blue one is the trigger wire for camera2. We've tested that the temperature given out by the electric components inside the monitor can increase as high as 80 centigrade, which may cause the monitor to stop working and shorten the life of all the electrinc components inside. Plenty of radiation windows ensure there is no high temperature inside the monitor. Monitor housing can resist high temperature in cab. Especially in summer, when we park our truck in the open air, the temperature in the cab is rather high. In the market there are huge number of monitors whoes housings are made from PC, because it is cheap. The high temperature may distort the housing of this kind of low-end monitor. But, please do not worry, the housing of our monitor is made from PC+ABS, which has a higher ability in resisting high temperature inside the cab. Our monitor uses TECHWELL chip solution which is made in USA. TECHWELL chip is industrial grade solution. It is special desgined for auto electronic, more stable than the comsumer-electronic chip. Digital Wireless Receive Monitor(Model:SP-723H2). 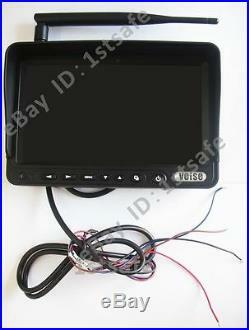 7 Digital Screen TFT LCD Monitor with Removable Sun Visor. Built in 2 CH 2.4GHz Digital Wireless Receiver. Operation Frequency:2400 2483.5MHz. Receiving Sensitivity-86dBm(1MHZ QPSK MD300RE). Display Resolution: 800RGB(H) X 480(V) dot. Wide view angle(CR>10):(up/ down): 45/65 (left/right): 65/65. Operating temperature: -20 to +70. Storage temperature: -30 to +80. External dimensions:(L x W x T) (185X122X28mm) without mounting Sun Visor. Digital screen, built-in digital wireless video receiver. Screen can be set as single view and dual view. Image can be adjusted horizontally and vertically to set mirror or non-mirror image. If the monitor works with two cameras, it can be set to scan automatically between cameras by the UP and DOWN keys. CH1 has rear distance scale which can be set as ON/OFF. The ambient backlit of the monitor can be turn ON/OFF, so at night the light of LCD screen will not dazzle the driver to ensure a safe drive. Monitor passed the load dump and ESD tests. Digital Wireless Wateproof Shockproof Camera. 1/3 COLOR CMOS Camera, 500tvl high resolution. (the same performance as ccd camera). Waterproof, Night Vision, Wireless Digital Transmitter Built-in. How to install this system? Power the monitor's red and black wires by vehicle power DC10-32V. 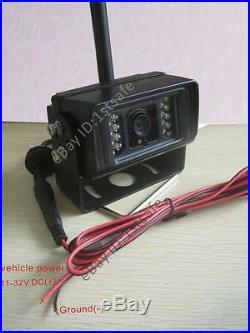 Power the camera's red and black wires also by vehicle battery DC10-32V or reverse lamp power. Then the whole system will work. Digital Wireless Waterproof IR Camera(MODEL:DF-8275H-SFS2). Image Type: 1/3 inch Color CMOS. Built in 2.4GHz Digital wireless transmitter. Transmission Power18dBm with Power control. Effective pixel:NTSC:720(H)X480(V);PAL:720(H)X480(V). Usable Illumination : 0Lux (Built in 18pcs IR LED's for Picture Support in the Dark). Free Operating Voltage: DC10-32 Volts. Dimensions: 106(W) x 75(H) x 70.4(D) mm (without mounting). Digital wireless video transmitter built-in. If have questions on how to install the system, please contact me! The item "WIRELES REAR VIEW REVERSING CAMERA KIT SYSTEM, CAB OBSERVATION, 7 LCD+1 CAMERA" is in sale since Wednesday, August 6, 2014. This item is in the category "Vehicle Parts & Accessories\In-Car Technology, GPS & Security\Parking Assistance\Camera, Monitor & Sensor Kits". The seller is "1stsafe" and is located in Guangzhou. This item can be shipped to all countries in Europe, all countries in continental Asia.